An old homeless man tries to pack more items into an overfilled shopping cart. 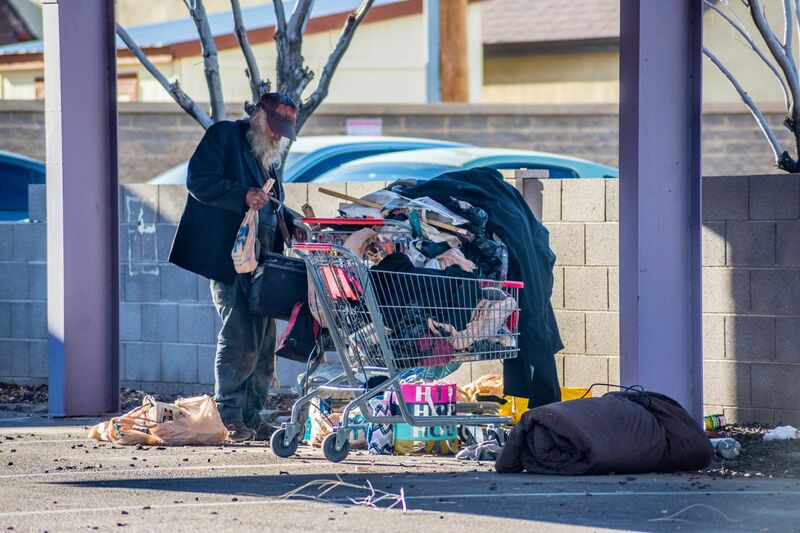 If current trends continue, the number of aging homeless people will more than double in three major metropolitan areas by 2030, straining social and medical services, a report released Tuesday concluded. It said improvements in housing, plus services aimed at preventing medical crises, could save cities money and improve quality of life for older homeless people. The report was the work of researchers from several universities, including the University of Pennsylvania and the University of Delaware, and was funded by four foundations. Data from New York, Boston, and Los Angeles County were analyzed. An invitation-only group of government and managed care leaders met to discuss the report Tuesday in Washington. Dennis Culhane, a social policy professor at the University of Pennsylvania School of Social Policy and Practice who was principal investigator of the study, said the team found that it would be “cheaper to provide a housing solution” than to continue allowing aging homeless people to spend too much time in hospitals and nursing homes because they have no other options. Philadelphia’s homeless shelters also are struggling with an influx of older homeless people who have complex medical problems the shelters are not designed and staffed to handle. The city is working with area hospitals to provide better transitional care for homeless patients who no longer need hospital treatment but are too sick to live safely in most city shelters. The report said the coming boom in aging homeless people stems from a wave of younger, less educated baby boomers who faced economic challenges in their youth — falling wages and rising housing costs — and never recovered financially. A disproportionate number wound up homeless, an effect that has persisted for decades. Now in their 50s and 60s, they are biologically older than most people their age and already facing the medical problems of the aged. The average lifespan for a homeless person is 64, but many will live longer than that, Culhane said. The report projected that the number of homeless people aged 65 and up will grow from 570 in 2017 to 1,560 in Boston by 2030, from a little above 5,000 to 13,900 in Los Angeles, and from 2,600 to 6,900 in New York. The national population of people aged 65 or older experiencing homelessness is estimated to grow from 40,000 to 106,000 by 2030. The predicted spike is based on 30 years of existing census data. Culhane said cities everywhere are facing similar trends and results from the study will likely apply across the country. New York City spends an average of $25,000 per year on homeless people aged 55 to 59, a figure that rises to more than $28,000 in people aged 70 and up. That includes the cost of shelter, emergency department visits, inpatient hospitalization, and nursing-home stays. Costs hovered around $20,000 in the other cities. The researchers said the cities likely could save money, especially among the oldest, sickest group, by helping homeless people find permanent housing and providing them with adequate medical and social support. They estimated that Boston would break even if it added more housing and medical services, while New York and Los Angeles County could save $20 million to $33 million a year — about 13 percent. Plus, Culhane said, they would have “solved” the homelessness problem for older people. He said New York has already started subsidizing housing costs for older homeless people. Kaiser Permanente also is addressing elderly homelessness in Oakland, Calif.